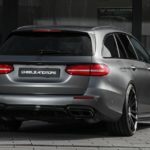 Even if German carmakers like BMW, Audi or Mercedes-Benz have taken the US market by storm, it seems that their wagon models are not appreciated, Americans loving instead the SUV variants. 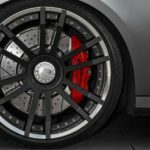 Particularly when we are dealing here with aftermarket customizations. 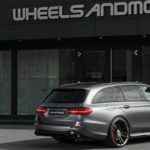 In Europe however, taking your kids to school in a tuned up wagon from Mercedes-Benz, it`s something cool and quite a head-turner, especially when leaving your kids in front of the school and revving the engine. 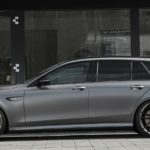 One of a kind model from Mercedes-AMG is the below E63 C wagon which wears the signature of the famous Wheelsandmore tuning firm. The model in question received makeovers at the exterior as well as an impressive power output under the hood. 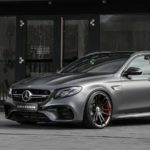 In the stock form, the appealing Mercedes-AMG E63 C features a massive 4.0-liter bi-turbo V8 engine with no less than 612 horsepower and 850 Nm of torque. And that my friend is truly impressive. However, with the tuner`s magic kit, this lad here is taken to extreme figures. 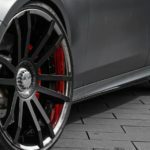 However, with the tuner`s new power kit, this German car achieves a new level of power. In fact, there are no less than three stages of power, with our model here coming with the third one and most expensive. 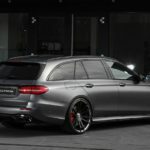 For starters, there is the shop`s stage I program, the German estate delivering 650 horsepower and 920 Nm of torque, while the stage II program takes it to 680 horsepower and 960 Nm of torque. Finally, the tuner`s stage III brings it to a massive 712 horsepower and 965 Nm of torque. All these levels of power were achieved thanks to some significant engine adjustments which significantly change the electronic parameters of the engine. 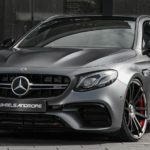 The most powerful one comes with a price tag of just 4,999 euros, which is more than convenient, especially since the shop also offers an unlimited warranty on the engine. 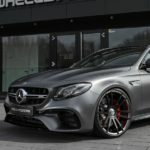 Visually, there are just a handful of subtle changes carried out like lowered suspension system and the tuner`s high-performance 21-inch alloy wheels. Thus, the model sits lowered and looks more aggressive with the new rims. 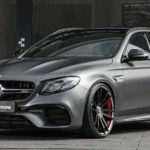 Enjoy the media gallery below with the Mercedes-AMG E63 C by WheelsAndMore!